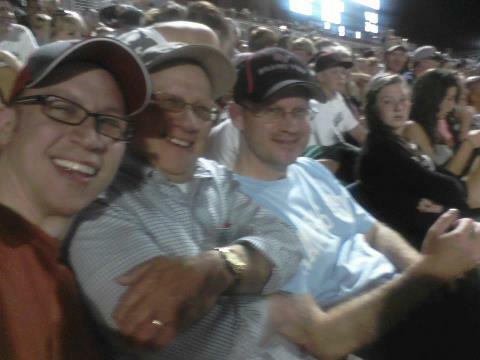 Saturday my brother Seth and I took our father Don to Omaha for the College World Series. I’d like to make this an annual event. We went with our brother Adam last year for the 1st time. 12 months ago we baked in the outfield sun at the brand new TD Ameritrade Ballpark. While we enjoyed the time with our father, it wasn’t a very energetic afternoon. You can imagine with the heat. This year was totally different. Since it was so hot last year, Dad suggested we go to one of the evening games. That we did. We picked a rematch of last year’s Championship Series between the 2 time defending champions of South Carolina and Florida. We drove through about 45 minutes of pretty heavy rain on I-80 east from Des Moines to Omaha. But it cleared up to be a perfect night for some college baseball. After stopping for a pre-game meal at “Jimmy John’s,” we headed for the stadium downtown. Like last year, we purchased GA seats. These tickets are not guaranteed to get you in the stadium. So that means you have to wait in line. After the Arkansas win over Kent State, the stadium was cleared and re-opened for the next game. TD Ameritrade Park seats 24,000 (The actual attendance last night was over 25,000, so they let in a few extra for standing room only). 5,000 of those seats are in the outfield (which are GA). When the seats are filled, they close the gates. We were very far back in line and weren’t very confident we were going to make it it. We found our seats in right field. It was a festive, lighthearted and fun atmosphere. In between innings, fans unleashed beach balls. They came out in droves. The LF GA and RF GA were also shouting back and forth at each other in a fun way, mocking who had the best seats. As for the game itself, The Gamecocks rallied from an early 2-0 deficit to win 7-3. They plated 5 runs in the 5th inning to take the lead for good. It was their NCAA record 22nd consecutive post-season victory. For what it’s worth, I am picking them to 3peat. It’s pretty cool to live in a small populated state like Iowa and have such a major sporting event within a short driving distance (2 hrs). It’s also great that a midwest city like Omaha has been able to host this event for decades. And will so for the foreseeable future. Happy Father’s Day Dad. Fun hanging out with you and Seth last night. Chillin at the College World Series from the RF GA. Yes it was a good time for sure, thanks for reading/commenting Tracey!